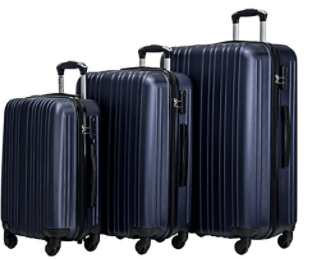 Merax Buris is a late 2017 hot new release three-piece luggage set of durable yet lightweight ABS hardshell material spinner suitcases of 20, 24 and 28 inches, at a budget price. It is offered in five colors of wine red, orange, deep blue, gold and silver. The obvious advantage of purchasing it in a distinctive color is the ease of finding your suitcase among lots of bags at the airport terminal. 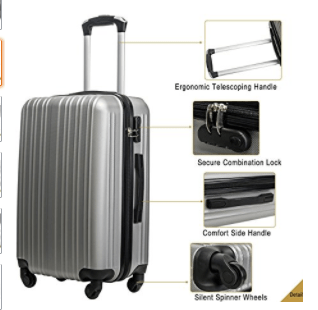 The ABS material used on the exterior of this luggage set is common to a variety of hardshell suitcase sets on the market, as it proves to be both lightweight, flexible, sturdy and able to absorb any impact. The three bags will be shipped fitted inside each other: The smallest 20” into the medium 24” and the medium into the large 28”. This is quite convenient as it will also save you space in storage when you’re not using these suitcases. There are four silent spinner wheels on each bag and adjustable telescoping handles that lock at three steps. And both of them will help you move the bags and to maneuver them easily, without much effort on your side. You need to check in both the medium 24-inch and the largest 28-inch suitcases and you can use the small 20-inch as a carry-on luggage. The 20” bag weighs 5.6 pounds and measures 20.7 x 13.4 x 8.3 inches including the wheels. The 24” weighs 6.9 pounds with the dimensions of 24.9 x15.8 x 9.6 inches. And the 28” weighs 8.7 pounds and measures 28.4 x 18.5 x 11.2 inches with the wheels. You’ll find mesh and zip elasticized pockets inside to help you pack your clothes and other stuff better. The bags are lightweight and have spacious interiors so you can put more of your belongings in when you’re going away and avoid the excess airline charges. They come with secure three-digit combination locks that are preset to 0-0-0. And you can change it to any number of your choice by pushing the button on the broadside. Bags have a nice pattern on the outside that also help prevent potential scuffs and scratches. There are very little price differences between different colors- of just a few dollars and it will come down to your personal taste. The Merax Buris Luggage Set is functional, versatile, reliable, comfortable to use, spacious, sturdy and durable, and low priced. You’ll get a global warranty of two years by Merax for if and when you encounter any problems during your travels. Please note that you can’t purchase these bags separately as they are sold only together. The product is rated 4.7 out of 5 stars as of today by four happy customers.